This is a project I approached with definite mixed emotions. My mother’s family lived in a very small farming community in the southwest, Virden, New Mexico. When people died, the men of the church made the wooden box and the women made the upholstery for caskets. As time went by and communication and transportation improved, the people of this little town did not want to give up their tradition of making the caskets. My grandfather was often called on to speak at funerals, and said he said the reason these caskets were so beautiful was because of the love that went into making them. I now live in northwest New Mexico. A lady in my church was wathing TV in her daughter’s living room. Her daughter said, “Mom, are you ready to go home?”, and realized her mother had died quietly in her chair. This family were really in dire straits financially and the men of our church made a casket. One day I got a wild idea and decided to make a casket for someone in my circle of loved ones. I approached my husband, and then my daughters and my mother. They thought it would be fine and not too weird. And so I began. Many thanks to Mark DeCou for his casket plans. In the second picture you can see the casket in progress before staining. My husband was looking at the lid and gave me his opinion, that yep the top board was warped and I needed to replace it. So I got my last piece of wood and measured and cut—-and nearly sobbed because it was two inches too short. A LJ has tag line, “Measure twice, cut once, buy more wood”. And so it goes. Now that I have finished making one with the assistance of my family, we have decided to make a couple more and just store them. Not because it saves money—and believe me it does over the cost of a purchased casket, but because of the good feelings we had working on thie project together and the thoughts of making something wonderful for a person we love. Finally—I hope this gift goes unused for a very long time. I’ve known churches where this has been practiced—I’ve always wanted to be part of one. The one that I knew of made very simple caskets and the church had a cloth pall that they placed over it. My family also has this tradition. This one is very nice. Your writing,,,,,well,,, very well said Grace. if not to intrusive, where does one store casket/s untill needed ??? Great job on the ‘box’. I really love this idea, will have to see what my family thinks about it. As far as wherre to store a casket—I am fortunate and live on a farm which means we have many outbuildings, barns, and machine shops. This casket has it storage spot in one of our smaller barns that is weather proof. The “box” is wrapped in a bed sheet and then loosely wrapped over that with a waterproof tarp. It also is raised off the floor with a couple of 2×4s. I put a few pieces of aromatic cedar inside to hopefully deter any insects, etc. Wonderful job. Great to keep the tradition going. I enjoyed the story of the tradition very much. A good friend of mine came to me and said he was making his mother a casket. He needed to use some of the equipment in my shop because he didn’t have what he needed. He finished the work with a little help from me and it turned out very nice. Tragically he was killed while on safari in Africa a short while after completing her casket. His rather large family, brothers, sisters, aunts and uncles came from all over the US for his funeral. His wife asked if they could possibly use my shop to make his casket. I of course said yes. They had brought all the wood with them but no tools. It was three days before the day of the funeral. My shop was transformed into a beehive of activity. Amazingly, The casket was completed on time and it was beautiful. He was laid to rest several years before his mother. Your casket is a fantastic job for which you may properly be proud! That is a wonderful tradition. Beautiful peice of work. I too have been asked to build a casket for my wifes aunt. Do you know where I can find some plans to build one and are there any legal stipulations or spects I would have to consider when doing so? Absolutely gorgeous work. Where did you get the hardware? Thanks for sharing the pictures and the tradition. Very touching story and great job on the project. These following links are from Lee Valley. They are for hinges, locks, a bracket to hold the lid open. I also included a link for the handles. 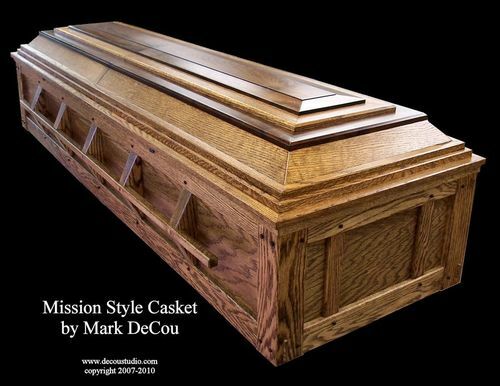 Mark DeCou sells a very nicely done plan for a casket. It also inclues pictures for how to complete a casket. His plan is for a mission style casket. If you use this style, you produce the handles and brackets yourself from wood. It is a very attractive casket. Mark DeCou has pictures of his casket on Lumberjocks. If you purchase Mark’s plans, they include pictures that show each step. They also have a schedule to follow that is specific to say what should be done in what order—In other words step by step. The above is one of Mark’s very elegant caskets created in mission style. Read his posts for details about how to purchase his plans and his story of making caskets. It is very well done worth your time. As far as what is required to use a home produced casket: The funeral industry is required to accept a casket provided by the family of the deceased. The only requirement is that a casket have a way to lock down the lid. Lee Valley and Rockler sell acceptable hardware to make the lid lock down. I made a lot of trial and error bits and pieces before I came up with the final way to line the lid of my casket. If anyone is interested in how I did the upholstery and lining of the casket anterior, feel free to contact me via e-mail and I will be happy to explain what we did. Finally, thank you all for your very kind comments. I appreciate them. Not weird at all. I think it is a huge honor to make caskets or to be laid to rest in a custom made casket. Same thing goes for cremation urns. What a cool way to finish things off. I too hope that thing doesn’t see use for a long time. Another thing to keep in mind if you want to go this route is that cemeteries can make up their own rules. So check with the cemetery you plan on using. They may require a vault for “home made” caskets. That is a significant expense as well. Also you will want to make sure the casket fits in a standard vault.